KeepSolid is an international product development company headquartered in New York, USA. They offer a wide range of solutions and services – from improved productivity to data protection and internet security – for both individual and corporate clients. The company believes that it’s the reliability of their products provides their customers with a competitive advantage. While practicing the productivity methodology, they take people and companies to the heights of productivity and reliability. 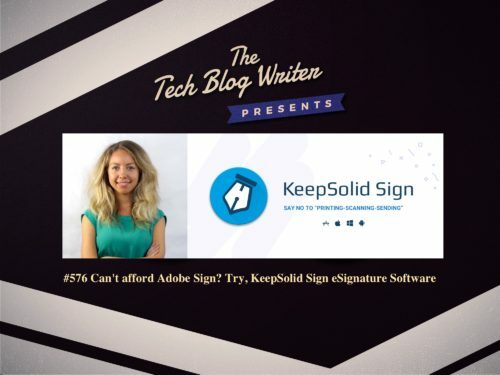 After hearing that KeepSolid has been working on an eSignature app that would offer a cheaper alternative to Adobe Sign, I felt compelled to find out more. I soon discovered that after extensive beta-tests, KeepSolid Sign is now available. KeepSolid has been collecting users feedback and implementing the most sought-after features. Now, this eSignature software is ready to help small and medium business owners to go paperless. KeepSolid Sign is an app that allows users to remotely sign any kind of document with just a finger, being free from paper chase, and minimizing possible misunderstandings and errors. It starts as easy as importing documents from Google Drive, Dropbox, iCloud Drive, Evernote, Finder, or Storage. Then these document can be shared and signed in minutes. The app allows to manage the signing order, specify relevant access rights, and add comments to set the record straight. Annotations, like initials, date, notes, and checkmarks, are also available. Any changes made to the documents won’t go unnoticed as the software will send a notification on each. Users can also easily check the status – sent, waiting for a signature, or completed – of the agreement in the app. I wanted to find out more about this more affordable alternative for smaller enterprises so I invited Julia Holovko on today’s tech podcast, who tells me all about the KeepSolid Sign App.